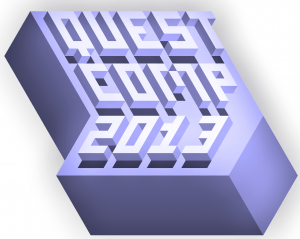 Submissions must be made using Quest 5.3 or 5.4 beta. Your use of Quest’s features will be judged individually based on the feature(s) you selected. EXTRA CHALLENGE BONUS: Include “reviving Bob with the defibrillator” from the Quest tutorial game. As long as the person’s name is a derivative of Bob or Robert, this idea may be reinterpreted however necessary to suit the genre you are working in (i.e. a spell named defibrillaticus, or a steam-punk device similar to a defibrillator). It is recommended that you test how well your game works when played online – you can upload a game to the site and set visibility to “unlisted” for testing. While “freeware” multimedia is permissible, entrants assume personal responsibility for the contents of their games and may be disqualified if any copyrighted material is used without permission.